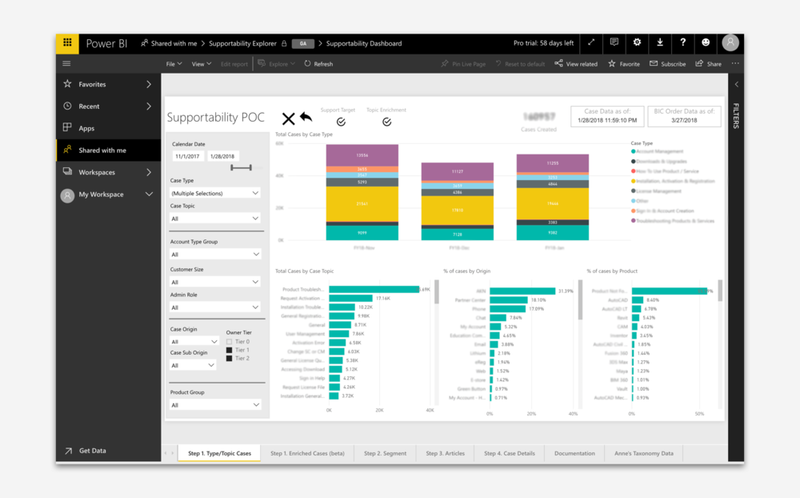 The Supportability Explorer is an Interactive data analytics tool to track self-service improvement initiatives. It’s a complex tool that allows stakeholders like product managers, the digital supportability team and the UX researchers to understand customer case related data from SFDC, Site Traffic, Articles Data, License etc. During my time in the Autodesk Digital Platform Experience team (Summer 2018), I focused on creating a more human experience for the stakeholders and helping them make better decisions for solution design for the business. Value to customer: Help drive self-service improvement, which in turn will enable Autodesk customers to get help faster and with less effort. The challenges came from platform limitation of Microsoft PowerBI, multiple data sources and the time constraints of the internship. By far the biggest challenge was to ensure that Supportability Explorer appeared visually simple, even when dense with information and content. The outcome of my preliminary workshops and stakeholder research, and the defining hypothesis of the re-design was that the stakeholders needed more than a data dashboard to support them in their workflow to improve self-service initiatives. The design served as an SOR for independent platform that could address needs around real-time and customizable dashboard along with better user experience. This was validated using extensive user testing and data analysis, both during design and with the prototyping stages. Improved visualization, search and exploration of the taxonomy for understanding case data. Implemented search for taxonomy by visual or through the keyword search. Integration of Customer Journey framework with case volume data. Segmentation Case Volume and details by Customer Journey phases and Uber Personas, and combined with CSAT scores to analyze the customer experience. Visualization of linked cases with their connected browsing history, to understand the customer pain points from their activity pattern.